NSK Spacea™ series bearings equipped with Molded Oil™ solid lubricant have solved a problem of premature bearing failures in the extremely demanding environment of a petrochemical plant in Spain. The bearings are installed on the submerged rollers of a conveyor belt and are directly in contact with water, hydrocarbons and particles in suspension from the production process. The ingress of these contaminants was causing the original bearings to fail within a year, resulting in costly maintenance and production downtime. Few working environments can compete with the potent mix of production demands and pressures routinely encountered in chemical and petrochemical processing. Numerous rotating machines are required to successfully complete these processes and deliver products on time. The use of bearings in such applications provides many technical challenges. One such challenge was faced by NSK’s customer, an engineering company supplying auxiliary equipment for petrochemical treatment plant. The company was experiencing regular failures of deep groove ball bearings on submerged conveyor rollers, which were the critical point in the conveyor design. After failing to find a solution with its own engineers, the supply company called in NSK to analyse the application and propose corrective measures. Subsequently the petrochemical plant was visited by NSK engineers who discovered that the problem was one of ingress of contaminants, water, hydrocarbons and solid particles. The first two contaminants were causing lubricant loss and corrosion, while the third was causing damage to the bearing raceways. In order to solve these problems, the NSK engineers recommended using stainless steel bearings from NSK’s special Spacea series of bearings, complete with DDU type contact seals to deny contaminant ingress. In addition, to ensure effective lubrication under the extreme working conditions, the use of solid Molded-Oil™ was considered the best option. The SPACEA™ series is a special range of bearings designed to provide high performance and reliability under all types of demanding operating conditions: contaminated, corrosive, super-clean, vacuum, non- magnetic, high/low temperature and high speed. The bearings meet the widest range of technical requirements with a programme of high performance materials, surface finishes and specially developed lubricants, including solid types such as Molded Oil. The H-20 Spacea bearings provided for the use on the petrochemical conveyor rollers are manufactured with outer and inner rings and balls of Martensite stainless steel for maximum corrosion resistance. The bearing lubricant, Molded Oil, has been specially developed by NSK for use in water and dust contaminated environments. In real world tests, Molded Oil offers more than twice the operating life of grease lubrication in water contaminated environments. In addition, the technology means that operating environments are kept free of grease; and there is no need for refilling of lubricant, as Molded Oil provides a continuous supply of lubricating oil. Importantly, Molded Oil also effectively overcomes the problem of loss of lubricant due to water ingress. The sealed Spacea bearings complete with Molded Oil lubricant were installed on the conveyor rollers with excellent results. 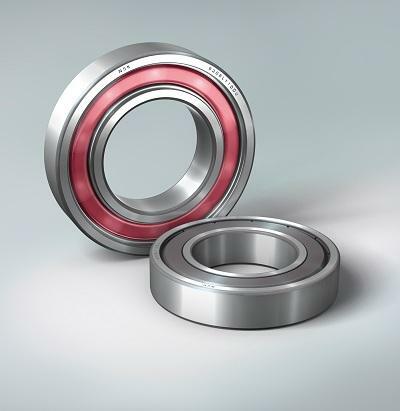 To-date the bearings have performed for more than one –year without problems, easily exceeding the bearing life originally targeted.